Well HELLO Folks!!! Welcome to 2016!!!! We're excited to have you playing along with us for the 2016 challenges. Thank you to those of you who played in our 2015 ones, as well. We know resolutions, one little words, pacts and more are in everyone's thoughts, so keep those in mind when working on this month's challenge. 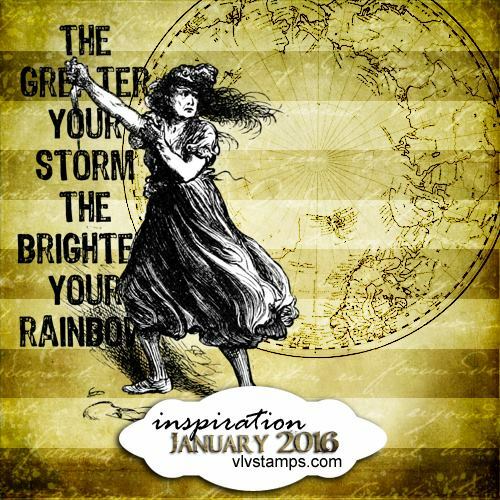 We'd also like to inspire you with words like femininity, women, exploration, rainbow, neutral and nature, storm, maps, vintage, writing, script, yellows, tans, black and white, stripes, bold, rainbows, storms and more!